Unless you've been living under a rock (or just very much removed from social media, in which case, I applaud you for going to a place I never will), then the concept of "woke" being used as an adjective is not a particularly new thing for you. As in, "stay woke." You've seen that phraseology floating around, I'm sure. But what does "woke" mean, specifically, when used in that form? I can already hear the Baby Boomers grumbling about the future of the English language, but honestly, they're the reason we pepper our sentences with extra "likes." They can, like, go grumble elsewhere. According to Dictionary.com, "woke" is the past tense of "wake" — as in, someone who is past the process of waking up. They're done with it. They've moved on. They've evolved from, you know, being asleep and hitting the snooze button 15 times. And frankly, that's a pretty accurate description of how "woke" is currently being used as an adjective. 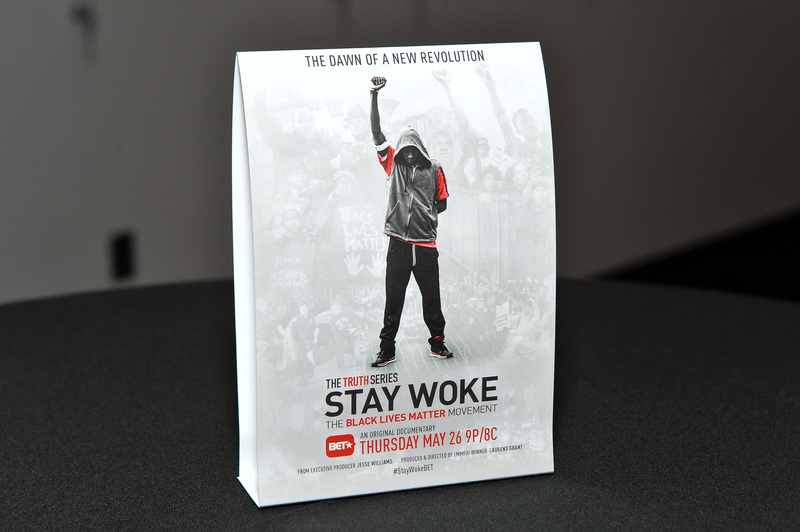 The rise in popularity of "woke" has been tied to the #BlackLivesMatter movement, which initially surfaced in 2013 following the death of Trayvon Martin. #StayWoke often accompanied social media posts about police brutality, systematic racism and the industrial prison complex. #StayWoke reminds readers to look past the provided narrative, to examine their own privilege (or lack thereof). #StayWoke reminds readers that there is more than one reality to life in the United States. The actual phrasing of "woke," it should be mentioned, has been a part of black culture for decades. It's not the first AAVE word to be taken up by the greater public ("bae" and "twerk" and "trap queen" are just a few), and it certainly won't be the last. If you are interested in a detailed timeline that charts the recent evolution of "woke" in pop culture to its use today, I'd highly suggest checking out this article by Charles Pulliam-Moore. It's fascinating. More recently, Erykah Badu used "stay woke" in her 2008 song Master Teacher, and by 2011 the phrase had begun to gain popularity as a way of describing an informed, questioning, self-educating individual, which is essentially how we use it today. Four years after the death of Trayvon Martin, "woke" is on MTV's Top 10 Teen Slang Words for 2016. BuzzFeed just published an article about everybody's favorite woke bae, Matt McGorry (a must-read, tbh). You can take quizzes to test how woke you are and Twitter now urges you to #StayWoke about everything from fast food conspiracy theories to ridesharing price surges. That's fine. I took those quizzes, and I love Matt McGorry, who is both woke and bae. But just remember the roots of "woke" when you use it, because it embodies a lot more than just a "grammatically incorrect" hashtag. Editor's note: This article was updated from its original version on Feb. 26, 2018.